It’s not hard to imagine why the announcement of Tribe Of Pazuzu and their debut EP release Heretical Uprising turned some heads on first notice: It’s not often you get a group that unites musicians with credits to their name like Cryptopsy, Incantation, Soulstorm, and Pestilence. Yet that’s what this hybrid Canadian/American death metal band does, combining the forces of bassist/vocalist Nick Sagias, guitarists Randy Harris and John McEntee, and drummer Flo Mounier. Together they’ve recorded five songs and just over fourteen minutes of high speed death metal that is surprisingly straightforward, bludgeoning, and clear-sounding from a collective of musicians whose previous groups have alternated between sounding like cavernous whirlwind maws of death metal and sheer technical chaos. Tribe Of Pazuzu‘s somewhat thrashier offering moves quickly, with a take-no-prisoners approach, and is so surgical about it that after its fourteen minutes wrap up, you’ll likely be a couple of spins into Heretical Uprising before you can even sort your thoughts from the first run-through. This is in part due to the fact that three of the songs are sub-three-minutes long — and in one case, under two. They hit incredibly fast, and Tribe Of Pazuzu make it clear that fast is basically their chosen gear. Strangely, this is made much more evident by the under-two-minute song just mentioned — the one minute and thirty-five seconds of “Indoctrinated To Enslavement”. Although its shorter run time might suggest the band are kicking out a legitimate grind song, “Indoctrinated To Enslavement” is actually the slow-groover of the disc. It’s the song where Tribe Of Pazuzu really lean into the chainsaw guitar aspect of their sound and buzz away with it while the vocals move through each percussively written verse, matching the caveman-like hitting of the drumkit for each rhythmic burst. Yet, they do this for such a short amount of time that it feels like the band had a moment of, “Alright, we’ve said everything we can here, let’s kick it back into high gear”. And so they close out just as quickly as they started, which leaves “Indoctrinated To Enslavement” — whose title pronunciation throughout the song has now wormed its way into my skull so that I can hear it even when typing it out — feeling like both the closer to the song prior, “Divinity Destroyed”, which has a similar closing rhythm and overall lumbering nature, and the opener to the next track, “Blind Disciples Of Poisonous Faiths”. If you’re wondering if the band are pulling from the book of anti-religion for lyrical inspiration, by this point, and with only three of the five songs mentioned, the answer should be pretty clear. Heretical Uprising‘s title song and opening track starts with — and then contains within – a multitude of near-thrash guitar solos and leads that honestly wouldn’t be too out of place on a death metal oriented Slayer album. In a strange way, its actually not too difficult to see the relation between the death metal world and its thrashier elements in the opening minutes of this EP, something that has been written about for ages yet made plainly clear by the Tribe Of Pazuzu‘s opening guitar-slaughtering. With its fast pace and circle-pit-marathon style of songwriting, “Heretical Uprising” also becomes one of the standout tracks among the five present here. 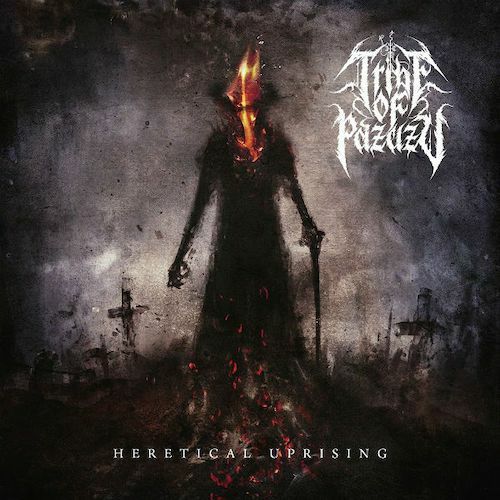 The other is the closer, “The Proliferation Of The Final Plague”, which is where Tribe Of Pazuzu dive fully into the murky waters of their death metal sound: It’s a big and bellowing beast of a track that just steadily blasts away for a healthy majority of its near-four minutes. It and “Heretical Uprising” feel like the second pair of song-relatives on the EP, especially given the two-and-a-half minutes in the middle of “Heretical Uprising”. The similar themes running between the two paint the band as having approached a fork in the road, and their decision resulted in Heretical Uprising‘s bookending songs. Yet yet the beginning and end of the EP being as monstrously strong as they are makes it so that the slower (relatively speaking) midsection of the EP doesn’t drag. The sheer-adrenaline rush via speed that starts off the whole affair doesn’t let up much. Since it was joked about above, I have listened to Heretical Uprising a lot. You forget that it’s only fifteen minutes long because it’s the sort of release that keeps whipping past your vision. It’s ephemeral in that respect, like a wall of fire that razes a town and then just as quickly puts itself out. It feels part proof-of-concept and part song-expulsion. It shows that the union of these four collaborators can whip out some pretty solid death metal tracks. They don’t break the mold, but the quick-tempoed nature of how they write has the band straddling a line in a world of death metal with a severe thrash-bent in some of their guitar leanings — like a newly discovered missing link between the two genres to go alongside the rest of that specific subgenre. There’s some ferocious death metal at work here — I’m always a sucker for the blastbeat-heavy songs like Heretical Uprising’s closer — but it’s also a very specific point in history. There’s no looking forward here. Heretical Uprising seems to exist in the NOW, and that sense of urgency is just as fleeting as it’s always been. Heretical Uprising is surgically quick, flashing into existence, and disappearing just as fast. This is the kind of EP one could put on repeat for most of the day and not get tired of; great stuff for sure!